Home Entertainment Let’s Look at Lee Min-jung’s Best ‘Running Man’ Appearances! Let’s Look at Lee Min-jung’s Best ‘Running Man’ Appearances! Running Man is a variety show that’s very popular in Korea. Besides having a theme that is always different every week, the show always has different games, too. Running Man always invites many stars from the entertainment industry to participate in the competitions along with the regular cast members of the show. Lee Min-jung has appeared as a guest star on the show several times, and played with Running Man members. Her appearance always steals the audience’s attention, too. Lee Min-jung is a South Korean actress who debuted in 2004. Now let’s see what Lee Min-jung did on her several episodes of Running Man. As we know, Lee Min-jung was a guest on Running Man for only two episodes, namely episodes 72 and 73. At that time the show was held in Hong Kong in early December, coinciding with winter. Jung Yong-hwa also participated in the Hong Kong episodes. 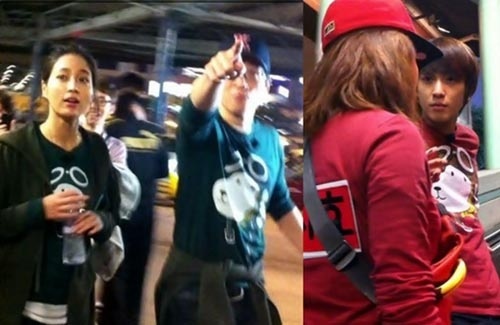 When they arrived in Hong Kong to shoot, the Running Man cast members were warmly welcomed by Hong Kong residents, some of them even shouted out the names of Running Man members they idolized, which made all the cast members more enthusiastic in completing their mission. On the first day of play, they were divided into 3 teams. The Green Team consisted of Lee Min-jung, HaHa, and Yoo Jae-suk. The Red Team consisted of Jung Yong-hwa, Kim Jong-kook, and Song Ji-hyo. The Kunging Team consisted of Kang Gary, Jin Suk-jin, and Lee Kwang-soo. For the first challenge they had to complete the mission by answering questions while on the biggest escalator in Hong Kong, followed by the second game in the Hong Kong bay, and finally at the hotel where they were staying. The second day of play was an individual game. All the Running Man members were spread out in several different venues, with different missions. They had to collect in the place of the legend of 9 dragons, to match the gold medal with their partners in the dragon statue. When they wanted to shoot in the morning on the second day, the bare faces of Song Ji-hyo and Lee Min-jung’s became a topic of conversation, and stole public attention because of their beauty. In the picture it was very interesting to see, especially Song Ji-hyo who looked very eye-catching and Lee Min-jung who showed off her beauty. Both of them received a lot of interest from residents in Hong Kong. In one of the pictures of Lee Min-jung was seen with Yong-hwa, and they looked like a couple, and reminded watchers of a scene from a movie. Did you guys miss this episode?